I don't usually stitch cutesy things...I'm more of a primitive girl myself! 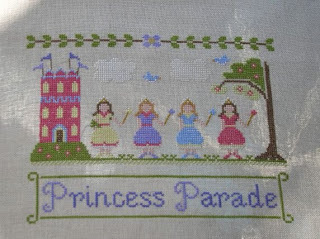 But I'm going to stitch two more of these "cutesy" things for my granddaughter's room as soon as I get the charts. Please excuse the picture....I thought by putting it on my glasstop table outside I'd get more light but all I got was the table legs showing through! Oh well, maybe next time. Adorable finish Carol! And perfect for your granddaughter!! I love that design. Any little girl would, I'm sure. Found my way here from Vikki Clayton's board. Have fun with your new blog. It's looking good.